PHILADELPHIA - April 25, 2016 - PRLog -- Soundview Executive Book Summaries has chosen How Great Leaders Change Their Minds to Change the Worldby Al Pittampalli as one of the 30 best business books of 2016. Soundview summaries are easily accessible from your computer, tablet or smartphone. 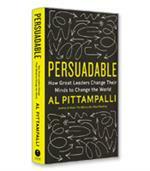 In Persuadable, you'll learn why being persuadable yields accuracy, agility and growth. But Pittampalli doesn't just explain why you should be persuadable. Distilling cutting edge research from cognitive and social psychology, he shows you precisely how by outlining seven key practices: consider the opposite, update your beliefs incrementally, kill your darlings, take the perspective of others, avoid being too persuadable, convert early and take on your own tribe.Through clear and compelling descriptions and stories, you'll learn exactly how to practice the art of persuadability. Rife with actionable advice, Persuadable is an invaluable guide for today's datadriven, results-oriented leader. Al Pittampalli is a business consultant who has helped organizations like NASA, IBM, Kaiser Permanente, Hertz and Hewlett-Packard to adapt to a fast-changing world. He is also the author of Read This Before Our Next Meeting, a manifesto for transforming the way organizations hold meetings. Founded in 1978, Soundview pioneered the concept of distilling the key points and ideas of full-length business books into condensed text and audio summaries, helping readers maximize their time and business intelligence. They have continued to enhance the summary content with author interviews, interactive author webinars, and video interviews with executives. Soundview's 100,000+ subscribers worldwide include CEOs, government leaders, entrepreneurs, business consultants, academics, and students. Soundview is a part of the Philadelphia, Pa.-based Concentrated Knowledge Corporation. Visit http://www.summary.com/subscription for more information about Soundview Executive Book Summaries.